Check out the March issue of Specialty Fabrics Review for a spotlight on the Company and our Director of Engineering and Construction, Jacob Schwartz. ITS has completed work on the Camelback Esplanade Courtyard Refresh project. The project included a new central courtyard shade structure with (20) new PVC-Coated Polyester Mesh Shade Sails, a new valet canopy with a waterproof membrane and (22) new aluminum awnings which also included a PVC Composite skin. The new look adds to this already well-recognized mixed-use area in central Phoenix. As the year drew to an end, ITS was recognized and awarded the International Outstanding Achievement Award by the IFAI for three separate projects in 2016. The Fiesta Paseo Nodes Structure Type I and Structure Type II received awards for the Freestanding Structures category while the Burger Theory Project was awarded the Outstanding Achievement Award for the Facades category. Work was recently completed on the new patio canopy at the Sonoran Clubhouse at Desert Mountain. This fitness, tennis and spa center which is nestled in the prestigious private community and surrounded by a series of Jack Nicklaus Golf Courses received an expansive makeover that included a new PVC Coated Polyester Membrane canopy. The renovation work to the Scottsdale Osborn Medical Center includes a new PTFE façade cladding system. ITS has begun work on the façade membrane engineering and is excited to see this work completed in the coming months. Like other similar applications ITS has completed, the tensile membrane façade cladding will top out at 100′ above grade and will add a creative architectural element to the building. A new Burger Theory restaurant was incorporated into an old building associated with the Holiday Inn in downtown Phoenix. As part of the restaurants design, an ITS fabric façade system was created to add a vibrant new look to the building. Backlighting was also added to the system which further increased the architectural impact of the façade. A lively and architecturally intriguing new exterior elevation was achieved. Work was recently completed on five new shade structures for the paseo pocket parks on the Fiesta District Improvements Project in Mesa, Arizona. These exciting structures utilized two very different design approaches. The Type I structures were a statement in creativity, engineering and imagination while the Type II structures were a balance of simplicity and elegance. ITS was thrilled to be a part of this beautiful project which was the perfect addition to the already exciting architecture of the Mesa Fiesta District. The Chandler Regional Medical Center was awarded the 2015 Design-Build National Award of Merit for Healthcare Facilities by the Design Build Institute of America (DBIA). This project utilized a composite PVC-Coated Polyester Membrane façade combined with LED lighting to create a glowing tower beacon on the side of the hospital. ITS was honored to be part of this great project in the delivery of its iconic Beacon Tower. SkySong 3 is awarded the Best Mixed-Use Project at the 2015 RED Awards. This LEED Silver certified project has office, retail and multifamily components to it and has made a major economic impact to the area. The SkySong Architecture has innovative and cutting-edge elements including vertical shade fins delivered by ITS which provide exterior sun protection and reduce solar effects on the building. The GoDaddy Global Tech Center was awarded the Best Office Project at the 2015 RED Awards. This impressive project had numerous jaw-dropping features that are the envy of any office project. Not the least of these was ITS’s tensile membrane structure which surrounds the outdoor basketball court. 60 different membrane panels and 12 supporting steel frames cantilever 30’ above the court while creating a dynamic shade pattern against the pavement below. This amazing project is something to see! 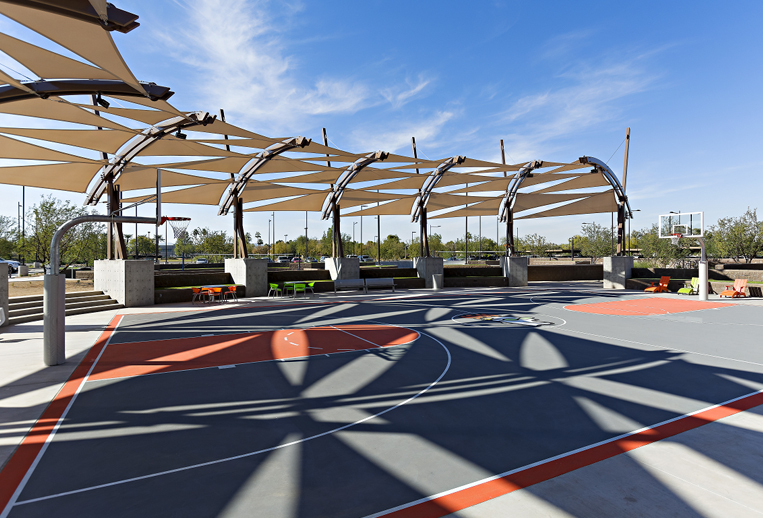 A defining and extraordinary tensile membrane structure provides shade to the pop-jet water feature and play area in the middle of Tolleson’s Downtown Redevelopment. The Structure design was inspired by a mosaic tile and is sure to be an iconic architectural feature for Tolleson and its community for years to come. International Tension Structures has been awarded the design-build contract to deliver approximately 27,000+ square feet of shade to the U.S. Army National Guard’s Silverbell Army Heliport. The ITS-design includes arching structural beams and rafters which each span over 60’ and has a barrel vault design. The structure design was inspired by the army helicopters they are being used to shelter. The Chandler Regional Medical Center Project is symbolized as a beacon of light and hope for all of those who need it. Out of this symbolism, came an architectural feature; The Tower Beacon. The concept was to design and construct a 100 foot tall lantern-style beacon on the side of the hospital. Support framework shot out from grade in three directions and was wrapped in a translucent fabric membrane to allow it to be lit from within by LED light fixtures. Not only was the beacon to tower 100 feet above grade but it was also located directly adjacent to the hospital’s emergency helicopter landing pad. This resulted in more stringent loading requirements and engineering. The beacon tower was a major success. With praise from the client and positive tweets across the social media blogosphere during the beacon’s initial lighting ceremony it was easy to see that this architectural feature made a huge impact to the project and its surrounding community. The New Amphitheater Canopy Structure is completed for Scottsdale Community College! This new canopy consists of a series of rolled steel beams that span over 50’ between support columns and crisscross each other at mid-span. This fun yet challenging structure creates unique space frames which support 16 tensioned fabric panels and delivers shade to the seating area below. The new Amphitheater canopy structure is part of the SCC Xeriscape Improvements Project.